Berkshire Hathaway's Warren Buffet, Amazon's Jeff Bezos, and Alibaba's Jack Ma. John D. Rockefeller became the first billionaire in 1916 during the first industrial revolution, and how he lived as an industrialist and innovator changed how people live. He gave much of his wealth away and had a massive social impact as a result. One century later, someone crosses the billionaire threshold every day. 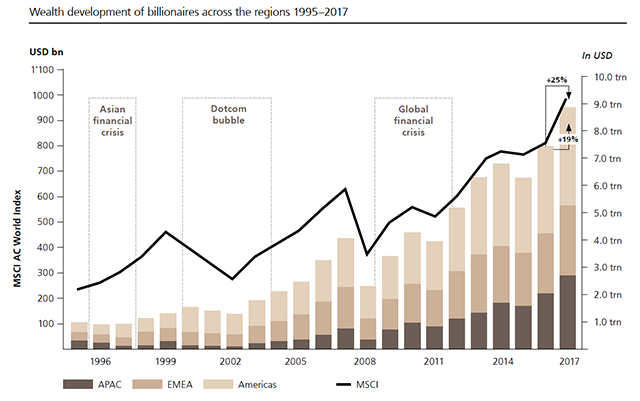 According to the 2018 “Billionaire Insights” report by PwC and UBS, there were 2,158 billionaires in 2017 having an average wealth of $4.1 billion, with overall wealth increasing $1.4 trillion to $8.9 trillion. Sixty percent of new billionaires are self-made innovators and business leaders. The new products, services and capabilities created by these entrepreneurs have revolutionized people's lives. Billionaires are responsible for 80% of the 40 most significant innovations over the last 40 years and last year, billionaires alone employed a larger workforce than the whole of the UK. Technology is the driving force behind what many of these billionaire entrepreneurs do. “The old way of thinking was that these technologies were a vertical,” said Mathews. “We have to think about this differently going forward—technology is really a horizontal, it’s not a vertical any longer.” Since other industries like retail and financial services rely heavily on technology, technology has become the horizontal and most other industries are verticals. Growth in China’s wealth is primarily from the country’s embrace of technology and desire to create infrastructure and encourage innovation. China’s 1.4 billion population is mobile first where no one uses cash or credit cards, and with 770 million new internet users, technology advancements and innovations are occurring at a faster clip than in any other country. The results are in the numbers, as in 2017, the MSCI China Index rose 54.1% and 631 IPOs in China raised $52.1 billion. Billionaires in China are also among some of the youngest; the average age is 55.75 years compared with 63.51 years for all billionaires. In the future, billionaires are expected to be even younger, more self-made and more entrepreneurial. How each generation made its fortune in China has changed. The first generation leveraged the country’s low wages and manufacturing. The second generation invested in real estate as people moved out of the country and into the cities during urbanization. The third generation created the foundation for large-scale ecommerce and the resulting instant scalability. The fourth generation is fostering the fourth industrial revolution by enabling technology. Government policies like the Made in China 2025 manufacturing initiative and the One Belt, One Road plan (also known as the Belt and Road Initiative) that ties infrastructure and trade routes throughout 70 countries in Asia, Europe and Africa will work to encourage business growth and increase wealth. What makes entrepreneurialism in China unique is that when innovators create technologies, they automatically look for a way to disrupt their own technology. They want to move faster so they build flexible companies that don’t need massive infrastructure and can scale. In general, today’s billionaires are redefining wealth management and succession planning. Over the next 20 years, more than $3.4 trillion is expected to be transferred to the next generation. What’s different with this next generation is that more women will run these businesses, increased entrepreneurship, families embarking on projects together and a prioritization of sustainability and sustainable investing. No matter which generation controls the wealth or where that billionaire is located, one thing is certain—they will work to change the world either through philanthropy or innovation.